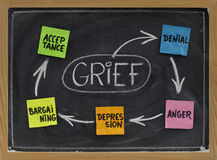 The term grief refers to the process of mourning over the loss of something or someone. We can all imagine what it is like to grieve a special person but someone could also grieve over losing a future perspective - such as becoming a parent- or a particular situation - such as losing a home or job. Most people find their own way in coping with the challenging feelings and thoughts involved in the grief process. But dependent on your relationship, social support network, your attachment to the person you lost, the circumstances of loss, and previous loss experiences, there are individual differences in the severity and length of the process. Common symptoms of grief are: irritability, emotionality, numbness, anger, disbelief, bitterness, feeling of detachment, preoccupation with the loss, inability of showing or experiencing joy. There could also be a series of physical symptoms related to stress caused by the grief process such as headaches, digestive problems, fatigue, chest pain, sore muscles. Although not everyone experiencing grief will meet the official diagnosis of 'complicated/prolonged' grief, it could still be enough reason to search for support and therapeutic strategies offered by a clinical psychologist. In our practice we offer therapy for grief and loss experiences by assessing the loss experience and the factors that are complicating a regular grief process. Understanding the process and situation you are in will provide us direction for therapy. Dependent on the stage of grief you are stuck in we could offer a variety of strategies to enhance your healing process such as rituals, writing techniques, imagination techniques or relaxation training. Selma will always listen carefully to your specific circumstances and symptoms to tailor her approach to your needs. Feel free to give us a call to understand what we can do to help you improve your mental and physical health.